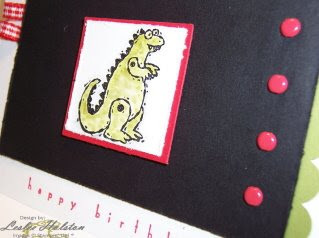 The dino was colored using Old Olive classic ink and a blender pen. I love the washed out color the blender pen gives vs. using just the marker. I make a 'puddle' of ink on the ink pad lid by pressing the lid into the pad (while closed, of course). I then picked up the ink with the blender pen. I used the tip of the blender pen to make dots on the dino to create a 'scaled' effect. I like to create depth to the image by adding a light color wash around the outside of the image. Here, I used Going Grey and a blender pen. The card was a hit at the party. Everyone loves dinos! What I think is special is knowing that this card will end up in a scrapbook for this young man. I love it when the time spent doesn't go un-noticed. 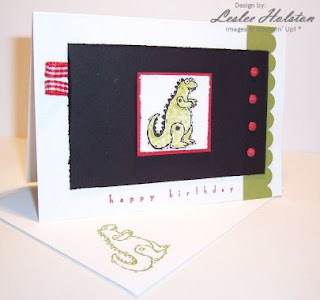 Little do they know that this card uses all scraps and took no time at all...shhhh! It's our secret! I hope you'll give the color challenges a try. They just might spark your creativity. Thanks for stopping by.